The snapper is practically matchless when it comes to how many different species there are of the fish. 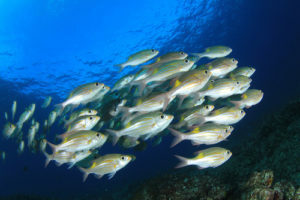 Over 100 distinct species can be found throughout the waters of the world, and some of them have developed a reputation for being very important food fish. Snappers usually dwell in tropical and subtropical areas of the ocean. Since there are so many different types of snapper, we’ll be taking a closer look at the red snapper for today’s blog. Even though the size of the fish is relatively small, the red snapper has become a highly effective predator, one of the best in the sea in fact. They remain strongly desired by fishermen and they’re usually considered a delicacy when they’re served in a restaurant. The red snapper can also live for a surprisingly long time when compared to other fish, more than fifty years in fact. The red snapper demands the respect of even the most expert fishermen. The fish’s penchant for putting up a strong fight makes it a formidable challenge. If you’re just starting to become familiar with deep sea fishing, the red snapper is not one of those fish that is suited for beginners. Get ready to have your skills quickly put to the test!